Chrysler may be killing the "Hemi" branding on most new vehicles, but as this photo of the new 2011 Jeep Grand Cherokee shows, that thing's still got a Hemi under the hood. This badge-killing's nothing more than Pelosi-is-watching green-washing. Remember the old "That thing got a Hemi?" ads? Increasingly, Chrysler's decided that most of their vehicles don't have one anymore. Except they really do. On a recent drive of the new 2011 Jeep Grand Cherokee we were told by Chrysler PR that the automaker still plans on promoting the "Hemi" brand in Ram pickup trucks and maybe in high-powered SRT vehicles. For the rest of the lineup running the engine — like the 300C, the Charger RT and the aforementioned 2011 Jeep Grand Cherokee — it'll be branded as the "5.7-liter V8." But, as you can see from the shot above, despite a lack of marketing in the 84 pages of press materials or over-sized chrome badges once a mainstay on the rumps of any appropriately-engined Mopar product, this new Grand Cherokee's still got a Hemi. 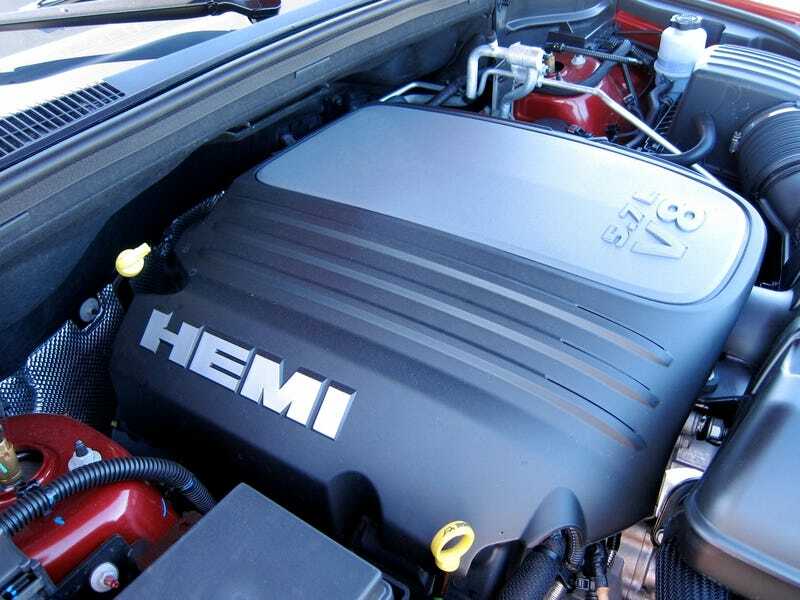 It just won't get the well-known "Hemi" moniker anywhere but in the engine bay. Chrysler engineers tell us that's because they'd have to go through environmental testing again on the engine if they were to change the cover on it (which means they actually did want to pull the name off the cover but decided not to spend the money ). Which is weird marketing strategy for Chrysler on the new Jeep. The brand used to wave the Hemi badge with pride — as you can see from the above commercial for the 2008 Jeep Grand Cherokee. And it shows. The 5.7-liter 360 HP Hemi V8's the engine owners will likely buy (at a four-to-one take rate in the 2010 model) or want to buy. We somehow don't see luxury SUV buyers getting geeked up over the new "Pentastar" V6 engine when they could be getting an ecoboosted Ford crossover. The Hemi name's the brand name Chrysler's got — one that the representative of one automaker told me they'd "give their right Vortec-branded nut to have" — and they probably should have proudly stuck with it. But really, this change by Chrysler isn't about making a greener vehicle — it's about making a greener image — and killing a very enthusiast-centric brand that has historically provided high levels of sales — to do it. In a Pelosi-is-watching world, the bigger-than-ever and better-than-ever 2011 Jeep Grand Cherokee was probably not the best choice for Chrysler's first post-bankruptcy new vehicle and the Pentastar brand knows that. In fact, it's scared the Hemi out of them.